Next post: Out of sight, out of mind? You know that quote about how if you don’t ask, the answer is always no? I asked and the answer was yes! My passion is writing. Right now I write headlines. It’s a fantastic job, don’t get me wrong. I love what I do. I remember years ago when I started, my co-worker and I were talking about how we get paid to read the stuff other people sneak to read when their boss isn’t looking. Here we were, spending 8 hours a day reading the Internet. We know what funny cat videos were buzzing. We got to try the newest web games. We always knew what was happening in the news. We picked up more relationship, healthy eating and 401k advice than I ever knew existed. Plus, I adore the people I work with. But I just miss being the one writing the articles. It’s a satisfying challenge to come up with a great idea, find people to interview about it, find just the right words. Then rewrite as you read through it. And again. Until it’s just perfect. Then you sell it to the editor. The rejections are many, but the wins are so sweet. So I just asked. 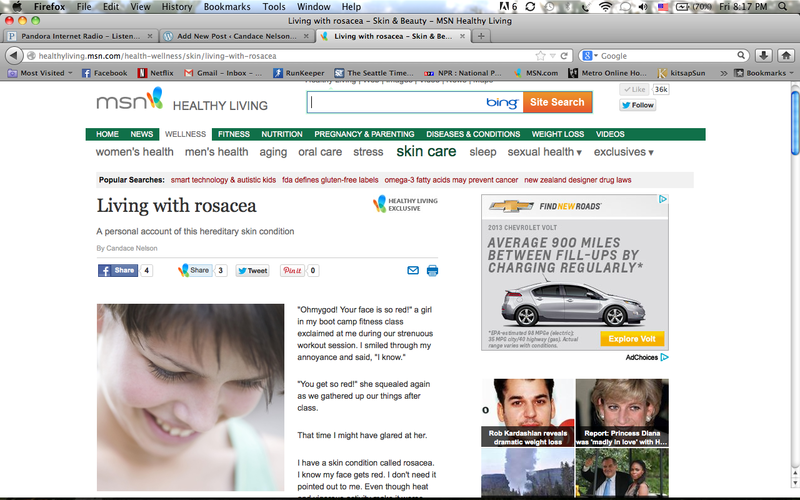 I asked the health editor if I could write a piece about rosacea. He said sure. His fellow editors on the health team loved it. It got posted to social media. It didn’t blow up the interwebs like a cute kitten video does, but I’m thrilled. I also asked another editor if I could write for her. She didn’t have anything at that moment, but she told her colleague of my interest. Things are happening.